2. The American Dairy Association’s famous “Got Milk?” slogan didn’t work so well in their translation for Mexico: “Are You Lactating?”. 4. Clairol’s hair curler, the mist-stick, had to be rebranded in Germany after they found out that “mist” in German means “manure.” The whiskey brand name Canadian Mist didn’t work out so well either. 7. Paxam labeled laundry soap using the Farsi word for “snow” — and Barf Detergent Powder was born. These examples demonstrate how bungled translations can derail the best-laid plans of companies in a global marketplace. Companies undertake massive efforts to integrate their production, goods, and services among disparate cultures, so why undermine all of that work with substandard translation practices? Skimping on the translation process doesn’t make sense when the stakes are so high. ORIGINAL ENGLISH: Spectacular translation fails are the stuff of legend. ARABIC: The amazing translation failure is a mythical material. CROATIAN: Spectacular translation fails to be a legend. FINNISH: Great translation is not a legend. THAI: An impressive translation fails as a myth. TURKISH: Great translation failure is part of the legend. As demonstrated with the Google Translate experiment, exceptional translations are as much an art as a science. 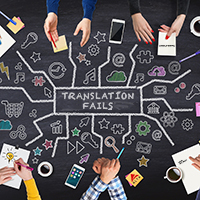 The best translators can convey the meaning and spirit of the source text while avoiding negative idioms and cultural references that can undermine a company’s best intentions. On the other hand, the worst translators (and translation software) tell your audience to eat their fingers or summon the dead. Employing professional translation services can save your company thousands, if not millions. With a network of 2000+ native language translators in over 100 languages, ALTA Language Services provides the best certified translation services in the industry. Make sure that your international business branding efforts are successful with ALTA’s translation services! For more information on our marketing translation, visit: https://www.altalang.com/translation-services/translation-for-sales-and-marketing/. Kim Horn lives in State College, PA, and has been working with Alta Translation Services for over 20 years as a project manager and typesetter.